What You Need To Know About Swine Flu Vaccine After two months of testing, the swine flu vaccine will be released this week. NPR's Richard Knox answers listener questions. Julie Halvorsen receives the trial swine flu vaccine at the University of Maryland Medical Center in Baltimore on Aug. 31. The first doses of vaccine against swine flu — officially known as H1N1 of 2009 — will start arriving at hospitals, doctors' offices and clinics around the country this week. That's record time for a new vaccine — only a little more than five months after scientists discovered the now-pandemic virus. The swine flu vaccination campaign is moving from planning to implementation, as Dr. Anne Schuchat of the Centers for Disease Control and Prevention puts it. At this key stage, we turned to listeners and readers to answer their questions about this new flu vaccine. Not sure if you should get the vaccine? Nervous about safety? Learn from our experts: NPR's swine flu czar Richard Knox and Dr. Richard Wenzel, a professor at the Medical College of Virginia, in Richmond answered your questions in a Web chat. "The H1N1 pandemic flu vaccine is made exactly the same way by the same manufacturers with the same processing, the same materials, as we make seasonal flu vaccine, which has an extraordinarily good safety record," says Dr. Anthony Fauci, director of the National Institute of Allergies and Infectious Disease. He is more responsible than any other single person for the fast-track development of this new flu vaccine. The new H1N1 vaccine has gotten more scientific scrutiny than seasonal flu vaccines do, he adds. "We don't even do those [clinical trials] with the seasonal flu vaccine," he says. But in this case the tests were needed so scientists and manufacturers could know how big a dose would be necessary to get a protective immune response. At the same time, Fauci acknowledges that it's just not possible — with any flu vaccine, and perhaps with any vaccine — to know in advance if it will cause rare side effects, such as the Guillain-Barre paralysis that a different, less purified swine flu vaccine may have touched off in 1976. If such a rare reaction occurred once in every 100,000 vaccinated people, Fauci says, "you'd have to put millions of people on a clinical trial, and that's not how clinical trials work." Nor would there be enough time to do it. 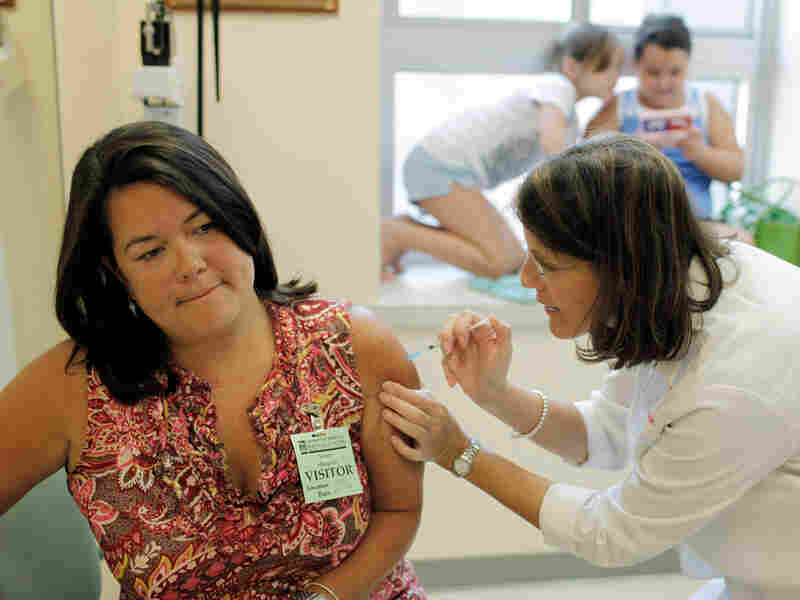 The CDC is planning to watch more closely than ever for serious side effects among those who get the new vaccine, says Dr. Beth Bell of the agency. The CDC will use, among other things, its own Vaccine Adverse Events Reporting System. It will be augmented by surveillance in the military services, the Veterans Affairs system, and a new "real time" monitoring system that involves health plans covering 15 percent of the U.S. population. "Erin, you should take the flu vaccine," says Dr. Frank Witter, a specialist in maternal-fetal medicine at Johns Hopkins University in Baltimore. "Not only should you get the seasonal flu vaccine, but also the pandemic flu vaccine." Since the new flu virus emerged last spring, pregnant women have been hospitalized and died from it at disproportionate rates — in fact, six times more often than the general population, says Witter. This fall Erin Bolton's pregnancy will be in its final stages, the time of greatest risk. That's another reason she shouldn't wait, he says. Some obstetricians worry that if they urge a woman to get vaccinated and she subsequently has a miscarriage — a common event that has not been linked to flu vaccination in the past — the doctor will get blamed. "Some people will be thinking, well, the vaccine caused the problem," Witter acknowledges. "But I would feel much worse if one of my patients died from influenza that I was unable to vaccinate against." As a young person with asthma, I am in the group of people who are supposed to get the first round of the vaccine. However, the nasal spray version of the vaccine, the only version available at first, is not supposed to be given to people with asthma. Should I risk it and get the nasal spray vaccine? — Meghan Guptill of Orinda, Calif.
You should wait, says Dr. Calman Prussin, an asthma specialist at the National Institutes of Health who's also an expert in vaccine side effects. Prussin says the nation's estimated 21 million asthma patients should get the flu shot, which contains pieces of a killed flu virus, but not the nasal spray called FluMist, which contains a live but weakened flu virus. That's because earlier studies have shown that the live-virus vaccine might precipitate an asthma attack. For asthma patients worried they might get the flu before they can get a flu shot with the killed-virus vaccine, Prussin recommends they plan with their doctor to get quick access to the antiviral drug oseltamivir, or Tamiflu, at the first sign of flu symptoms. "If it's taken in the first two days, it will decrease the severity of the flu," Prussin says. Prussin says people with asthma might also consider taking Tamiflu to prevent flu if they have been exposed to someone with influenza. What vaccine options will be available for children with egg allergy, the second-most-common food allergy among children? — Cathy Vesecky, Milburn, N.J.
People with egg allergies should not get flu vaccines in the regular way, says Prussin. But that doesn't mean they can't get vaccinated against flu. An allergist can determine the degree of egg sensitivity a person has and divide the vaccine dose into safe increments. Yes, pretty much so, says Dr. David Morens of the National Institutes of Health, who has studied the history of flu viruses. People born before 1957 were exposed to ancestors of the new pandemic virus, which are in a lineage that goes back to the notorious H1N1 virus that touched off the raging pandemic of 1918-19. That's why people older than 52 are likely to have some protective antibodies that "cross-react" with the new H1N1 flu. In 1957, for reasons flu experts don't fully understand, H1N1 viruses disappeared for 20 years. They were supplanted by other seasonal flu strains, such as the currently circulating H3N2. So younger Americans didn't get exposed to H1 viruses while they were growing up. Then in 1977, H1N1 came back into circulation, possibly because of a laboratory accident in Russia that released an archived virus. Since then H1 viruses have evolved further away from earlier versions. But Morens cautions that no age group is fully protected against the current H1N1 virus, so most doctors would urge people over 53 to get vaccinated after other, higher-priority groups, such as pregnant women, have had their chance. Yes, you will be able to request a vaccine that does not contain this preservative, even though government experts do not believe that vaccines containing thimerosal pose a risk. No, neither the swine flu vaccine nor seasonal flu vaccines in this country contain immune-boosting agents called adjuvants. The government ordered adjuvants in case the new H1N1 vaccine did not produce a high enough immune response. But in fact, tests showed the immune response was much better than expected, so the adjuvants will not be used. European countries use adjuvants in flu vaccines for older people, whose immune systems are not as robust. We use "swine flu" as one of several names, along with "pandemic flu," "the new H1N1" and "the new flu." We try not to refer to this new virus as simply "H1N1," although many do, because there are many H1N1 flu viruses, including a seasonal H1N1 that is still circulating. Genetically, the flu virus discovered last April is made up of genetic elements that have most in common with swine flu viruses, but also have genetic sequences from human and bird flu viruses. Scientists believe the new virus has circulated in swine for a decade or more without having been detected as a new virus. It jumped into humans more recently, but no one knows exactly where or when. The pork industry is concerned that the name "swine flu" implies to some people that they can catch it by eating pork products. There is no such risk.